Sometimes you must give up what you value most to gain what you want even more. With advice from a half-mad witch and help from companions she meets along the way, Catrin embarks on a desperate quest to defeat seven riddling Magpies–magical tricksters who can shapeshift into anything or anyone–and win back her book or face losing everything she holds dear. 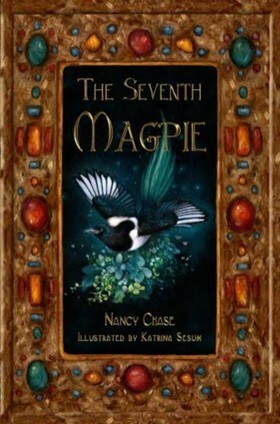 A lyrically-told fairy tale, poignant and bittersweet to the end, The Seventh Magpie is an exquisite debut by author Nancy Chase. Billed as a tale of “loss and renewal,” this novel offers a story of hope and despair, life and death, intertwined and inseparable by their very nature. In the aftermath of the effects of her decision, Catrin sets out to recover the book from the magical Magpies who initially gave it to her mother. Each day, for seven days, she must solve a riddle set by them. But there are two sides to every riddle, two sides to every story, two sides to every person. My only frustration in this story was that I felt that, in dealing with the Magpies, Catrin was a slightly different person–rude, impatient, almost violent. She felt immature in those scenes in a way that she did not through the rest of the book. I realize that in those scenes she was also facing the creatures that she believed stole her mother from her, but her approach in how she dealt with them didn’t shift / develop at all until the very end. I loved Catrin through out the book, except for those scenes. For the lyrical beauty of the prose alone, this is a fantastic read. For the story itself, it is a definite read. Highly recommend. Nancy Chase writes fantasy, science fiction, fairy tales, and paranormal fiction, often inspired by mythology, dreams, folklore, or history. She was born in Maine. Over her lifetime, she has worked as a summer camp cabin cleaner, apple picker, stable girl, political activist, beauty consultant, inventory taker, t-shirt silk screener, pet shop cashier, art model, convenience store clerk, hotel banquet manager, university secretary, magazine editor, freelance book doctor, and farmer. She can write a sonnet, dance a pavane, train a horse, shear a sheep, or milk a cow. She is slightly synesthetic. She has been inside the Tomb of the Eagles in the Orkneys and has done a Native American vision quest in the Sierra Nevadas. She prefers summer over winter, tea over coffee, her favorite color is green, and she has a peculiar obsession with collecting beautiful blank books in which she never writes. She lives in Virginia with her husband and an ever-changing array of pets.